Charlie Chaplin, Ingrid Bergman, and Frank Lloyd Wright all attended opening night. So did Gene Kelly, Billy Wilder and Igor Stravinsky. On July 30, 1947, in the midst of a blistering Southern California heat wave, Hollywood’s 260-seat Coronet Theatre swelled with A-list celebrities as well as cutting-edge artists and intellectuals of the era. In a movie town still years away from hosting legitimate theatre, everyone buzzed about what promised to be the cultural event of the year: the premiere of Bertolt Brecht’s Galileo. Some came to see the play’s star, Charles Laughton, already one of the world’s most admired actors of stage and screen, perform in the role of a lifetime. Others, particularly the European émigrés who knew Bertolt Brecht from his years at the center of the irreverent, radical, cultural ferment of 1920s Berlin, saw this as their only chance to again glimpse the work of the revolutionary playwright. Still others came to see the latest from the author of the world-famous The Threepenny Opera. By opening night, the entire four-week run had sold out. The Brecht-Laughton Galileo, like the improbable relationship of its two creators, came together at a unique moment in Hollywood history: the stunning 1930s migration of artists and intellectuals from Europe to America’s movie capital produced a potent cultural concoction of Marxists and vaudevillians, Shakespeareans and studio hacks, high art and low. It was here that Brecht and Laughton met, and the play, born in the shadow of one inquisition, was nurtured in the shadow of another. Brecht had written an original version of Galileo in 1938, during his six-year exile on the Danish island of Fyn near the small town of Svendborg. Denmark turned out to be only the first stop of his grudging, often painful banishment from Germany. He fled his homeland shortly after Hitler came to power – on February 28, 1933, one day after the Reichstag fire. 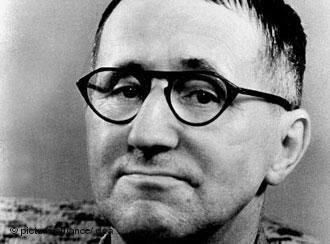 Brecht knew that his days in Germany were numbered: Hitler’s first targets were leftists and intellectuals. Brecht was both. His goal was to remain in Europe where he felt most able to participate in the struggle against the Nazis. From exile in Scandinavia, he wrote anti-fascist radio broadcasts, poetry, and pamphlets which were smuggled into Germany. It was during this period that he also wrote many of his greatest dramas, including Mother Courage and her Children, The Good Woman of Setzuan, and Galileo. Galileo was based on the life of the 17th century Italian physicist and astronomer who challenged the notion that the earth stood still at the center of the universe, but who then, under threat of torture by the Inquisition, recanted his findings. The story attracted Brecht largely for its current-day parallels: the crushing of culture and reason in Hitler’s Germany and the purges of intellectuals and dissidents in Stalin’s Soviet Union. When, during his long years of post-recantation house arrest, Galileo secretly resurrects his revolutionary scientific work and has it smuggled out of Italy, Brecht again saw the analogy to the underground resistance fighting against the fascists in Europe. In 1940, just as Brecht finished Galileo, Nazi troops invaded Denmark, forcing him to flee – first to Sweden, then Finland. As the Nazi noose tightened across all of Europe, he turned reluctantly towards America. Brecht was a committed Marxist, first being introduced to the theories of Marx when he was doing research for a play about the Chicago stockyards. But he held no illusion that the Soviet Union would be a safe haven for him. He had visited the Soviet Union in 1932 and 1935. Since then, one after another of his friends in that country had been imprisoned, executed, or simply disappeared. With generous assistance from other émigrés already established in the United States, Brecht was able to secure U.S. visas for himself and his family. This was no small feat, given both how difficult it was to obtain entrance into the United States during the war, and the fact that Brecht’s family included himself, his wife and acclaimed German actress, Helen Weigel, their two children, and his two mistresses-slash-artistic collaborators, Ruth Berlau and Margarete Steffin. Unconventional in his politics, his art, and his personal life, Brecht rejected traditional love as reeking of bourgeois ownership and property relations. Throughout his life, he was open about his numerous casual and long-term sexual relationships. He tended to be attracted to creative, independent women. And they were attracted to him. At 5’8” and 130 pounds, Brecht was physically frail. He had close-cropped hair, decaying teeth, deep-set eyes, and a scar across one cheek. He smoked cheap cigars, their smell clinging to his simple, baggy clothes. By all accounts, it was Brecht’s genius that attracted women to him. Unfortunately, as Brecht’s entourage made their way out of Europe, Steffin collapsed from tuberculosis and had to be hospitalized in Moscow. She died two days later. After a ten-day trip on the trans-Siberian railroad, his heart heavy with the loss of his homeland and a treasured friend, Brecht boarded a Swedish ship at Vladivostok, headed for America. On July 21, 1941, Brecht disembarked at Los Angeles’s San Pedro Harbor. He settled his family into a small house in Santa Monica, hoping to earn a living by writing for the movies. Already plenty of German-speaking émigrés had been successful in Hollywood – Ernst Lubitsch, Fritz Lang, Fred Zinnemann, and Billy Wilder, to name only a few. At first, however, Brecht found it nearly impossible to work in Los Angeles, feeling intellectually isolated, detesting even the climate. With the clear eye of the outsider, he called Los Angeles “Tahiti in metropolitan form,” where “homes are additions built onto the garages.” He wrote to a friend, “I have the feeling of being like Francis of Assisi in an aquarium…or a chrysanthemum in a coal mine.” He didn’t fit in. Nor did he wish to. Unlike many ex-pats, rushing to assimilate and make America their new home, Brecht always identified as an involuntary exile, waiting to go back to Germany. No small part of Brecht’s difficulty in coming to terms with his American exile was that suddenly he had no audience for his work. Although he continued to write for the theatre, his aesthetic stood in such contrast to prevailing taste that he most often found himself writing “for the desk drawer.” Two of his plays, The Private Lives of the Master Race and The Duchess of Malfi did open on Broadway, but both were critical and financial flops. And it was no wonder. The purpose of Brecht’s aesthetic was to encourage his audience to think rather than feel. He advocated a style of acting, story structure, and staging that denied the audience easy identification with the characters or an emotionally satisfying catharsis at the conclusion of the drama. His concern was social conditions, not individual psychology. His hope was to educate people, to give them tools to better understand and change the world. He considered much of what he saw of American theatre and film to be empty, bourgeois entertainment, opiates for the masses. It simply didn’t interest him. Even with the success of Hangmen, Brecht continued to be worried about his precarious finances and disgruntled with his cultural surroundings. “The intellectual isolation here is monstrous,” he wrote. “In comparison with Hollywood, Svendborg was a world-center.” Brecht might have found solace within the community of like-minded leftist refugees, but he did not. His interactions with other exiles were often fraught with conflict. He feuded with academic Marxists Theodor Adorno and Herbert Marcuse, calling them cultural elitists; he offended Auden and Isherwood by dismissing their spiritual beliefs; he despised Thomas Mann. He did, however, count among a handful of friends, Peter Lorre, novelist Lion Feuchtwanger, Hanns Eisler, William Dieterle, and Salka Viertel. Viertel, screenwriter of Queen Christina and other Garbo vehicles, hosted a kind of old-world literary salon where artists, musicians and actors, writers, directors, and philosophers – most of them left-leaning, most of them exiles – gathered each Sunday at her house in Santa Monica Canyon. On any given Sunday, Aldous Huxley, Marlene Dietrich, Charlie Chaplin, or Paul Muni might show up. And it was here that Brecht met Charles Laughton. When Bertolt Brecht asked Charles Laughton why he acted, Laughton answered, “Because people don’t know themselves and I think that I can show them how they tick.” Brecht and Laughton connected from the start. At a time when most stage actors eschewed work in movies, Laughton embraced it. He starred in Alex Korda’s Rembrandt, became the tortured Quasimodo in The Hunchback of Notre Dame, and gave a tour de force comedic turn as an English butler in Ruggles of Red Gap. He won two Oscars – one for his role as the king in The Private Lives of Henry VIII, the other for his brutal martinet Captain Bligh opposite Clark Gable in Mutiny On The Bounty. By the late 1930s, Charles Laughton was an international star. Despite his fame, Laughton was plagued with self-doubt, insecure about his talent. He also suffered self-loathing about his homosexuality. He had married actress Elsa Lanchester in 1929. One year after their marriage, he told her that he was homosexual. Shocked at first, she made the decision to continue the marriage, putting up with her husband’s relationships with men. “We both married for protection against society,” wrote Lanchester. “There was loyalty to the idea of marriage, there was mutual protection, and tolerance and respect.” The two shared a love of nature, fine art, and literature. They explored new places together, amassed a remarkable art collection, and shared the ups and downs of their creative lives. For years, they divided their time between homes in London and Los Angeles, finally settling into a spacious old house with a rambling garden on the cliffs of Pacific Palisades, overlooking the ocean. While Laughton’s marriage endured, his film career did not. By the time he met Brecht, in 1944, he had been relegated to bit parts in mediocre movies. When Brecht asked Laughton if he’d like to work on translating Galileo and play the lead in an English-language production, Laughton jumped at the chance. As Brecht strove for a more merciless condemnation of Galileo’s capitulation, Laughton pushed to humanize the scientist. The creative tension bore fruit. By the end of 1945, a new version of the play satisfied them both. Laughton showed it to Orson Welles who instantly signed on to direct. Unfortunately, the Brecht-Laughton-Welles dream team was not to be. After Laughton brought in Broadway impresario, Mike Todd, to produce, Welles quit. Welles was bitter towards Todd about what he viewed as a betrayal on a previous project (when Todd pulled out of the stage production of Around The World In 80 Days, Welles was forced to scramble for money). Before long, Brecht and Laughton clashed with Todd over their vision for the production, and Todd left the project as well. Enter Joseph Losey. Brecht had met the young American director a decade earlier in Moscow. As artists and leftists (Losey was a member of the Communist Party, Brecht was not), both were drawn to the politics and culture of the Soviet Union’s exuberant youth. A year later, Brecht had attended a Living Newspaper production directed by Losey in New York. Created within the New Deal’s Federal Theatre Project, the Living Newspaper was an experimental dramatic form committed to informing audiences about social problems, and calling for action to solve them. The dramas dealt with issues such as housing, civil rights, unions, agricultural depression, and health care. Using slide projectors, masks, characters placed in the audience, stylized staging, and episodic structure, the Living Newspaper appealed to Brecht on every level. Losey agreed to direct Galileo. And he convinced a New York producer, T. Edward Hambleton, to put up half the money for production. Laughton put up the other half. Both Losey and Laughton had movie commitments in Hollywood, so they decided to mount Galileo in Los Angeles rather than New York. But who would actually produce the show? And where would it run? Enter John Houseman. Houseman had produced Orson Welles’s early American shows (including Macbeth and Cradle Will Rock). Fired from the Federal Theatre Project after the Cradle controversy, Welles and Houseman founded the Mercury Theatre. Houseman produced Welles’s infamous War of the Worlds radio broadcast which panicked the nation, as well as his modern-dress Julius Caesar. The partners fell out when Houseman insisted that Herman Mankiewicz, not Welles, deserved credit for writing Citizen Kane. With the main pieces of the production puzzle finally in place, cast and crew were hired, and rehearsals began at the Coronet on June 24, 1947. While Losey was the official director, it was understood by all that Laughton and Brecht – and in particular, Brecht – were actually in charge. Brecht and Laughton were meticulous in their control over props, costumes, lighting, blocking, and every other aspect of the show. In the service of creating precisely the production he desired, Brecht lived up to his reputation of being harsh, intolerant, and even abusive. His difficulty with expressing himself in English didn’t help matters. The brunt of his criticisms fell on the design and technical staff. He clashed with the choreographer who was replaced by one Brecht had worked with in Germany. Houseman recalls, “That he was almost always right in his judgments did not diminish the pain and resentment he spread around him during the long, intense weeks of rehearsal.” Apparently, only Laughton and composer Hanns Eisler escaped his censure. After his sole, uncharacteristic blow-up, Laughton’s mounting stress manifested in quieter ways. The small Coronet theatre was bursting at the seams with a cast and crew of over eighty, so for the final rehearsals and during the run of the play, a trailer was parked out in back for Laughton to use as a dressing room and a place to rest. As the premiere loomed closer, he could be found sleeping in his trailer at all times of day – sleeping so soundly that the stage manager had trouble waking him. Finally, opening night. As L.A.’s cultural elite filled the theatre, Laughton lay trembling with fear in his trailer. With a sweltering heat-wave baking Los Angeles, he ordered trucks loaded with ice blocks to surround the theatre, “so the audience can think.” Then at long last, nine years after it was first written, three and a half years after Brecht and Laughton began their new version, Galileo opened. The spare sets, simple costumes, backdrops based on Renaissance drawings, and episodic set pieces were just as the creators envisioned. Brecht and Laughton were elated with the production. The reviews, however, were mixed. The Los Angeles Times called it, “a rich new experience…will capture the imagination of those who want to see drama put on a technically freer basis…the subject itself will unquestionably arouse marked controversial interest.” The Hearst owned Examiner called the play, “a harangue – and a fussy, juvenile harangue at that.” Neither Variety nor the New York Times were particularly encouraging. Laughton, however, received nearly unanimous raves: “an etched and nigh flawless performance,” “a personal triumph.” The play’s backer, Edward Hambleton, made plans to take the show to New York. After struggling with Galileo’s predicament for so many years, the irony that he was now himself facing an inquisition was not lost on the playwright. Of the nineteen “unfriendly witnesses” called, only eleven actually testified. Lost as a footnote to the legendary Hollywood Ten, Brecht was in fact The Eleventh. All except Brecht agreed to a strategy in which they refused to answer the Committee’s questions, standing on their First Amendment right to freedom of expression, and challenging HUAC’s constitutionality. Brecht broke rank with the others, citing his status as a foreigner, and choosing instead, with the consent of the other eighteen, a strategy of appearing to cooperate with the Committee, but actually undermining their investigation with a combination of cunning, obfuscation, and the pretense of politeness. Throughout his testimony, Brecht smoked a cigar (he knew that the Committee’s chair, Parnell Thomas, was partial to cigars), and used a translator who knew less English than himself. It was an exquisitely choreographed performance. Stripling: Did you write that, Mr. Brecht? Brecht: No. I wrote a German poem, but that is very different from this. That afternoon, Bertolt Brecht boarded a plane for Europe, never to return to the United States again.